Moving to France with your horse? 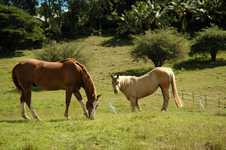 Are you thinking of re-locating to France and taking your horse with you? If you are and you are wanting to compete, then you will need to register your horse. An account of Angela Allen's experiences in attempting to do this follows. It is something she thought would be relatively simple, as all horses in the UK now need passports anyway and France is only a hop, skip and a jump away... but French horse bureaucracy was something Angela wasn't quite prepared for! Meanwhile, in order to register a horse in France, you need to have obtained a passport for the horse (now mandatory in the UK anyway), a sketch of the horse done by a French Vet, and an export licence. The horse also needs to have been micro-chipped. When Angela checked the Haras Nationaux website several months ago she found only three of the five horses were registered. Since then one more has been registered, but one non-thoroughbred is still missing from the database. And this horse, although not a pure thoroughbred, had excellent pedigree as it could be traced back to the famous Seabiscuit. Still, they had registered two unknown horses with Angela who she didn't know anything about! So Weatherbys were contacted, who said they had sent all the papers to France Galop. Yet Haras Nationaux said they never received any papers... so where had they gone? The Allens asked Haras Nationaux to take it up with France Galop rather than them being a go-between, which they are currently doing. The long and short of it is that the Allens cannot compete with this last horse until it is registered. Their only hope now is to send photocopies to Haras Nationaux and hope for the best. Angela feels that although the Haras Nationaux website states that horses don't have to be thoroughbreds to compete, English horses do. So although they've been in France just over a year now, with the time its taken for their horses to be registered, they'll be lucky if they do one show this year (Angela's daughters competed nearly every weekend in England). Not a perfect situation - but it's wise to expect teething problems like this when moving over to France. That way if things work out smoothly it'll be a pleasant surprise. I came aross the above article when "googling" for information. We are contemplating a move to France with our horses and wanted to know how easy/difficult it would be to register and compete in France. It would seem from this that we have to possibly contact France Galop and the Haras Nationaux to register the Thoroughbred horses with Weatherby's passports but not clear about the others. One is homebred and registered with the Anglo-European studbook. Her pedigree is known - she was homebred out of a Thoroughbred mare by an AES registered stallion. The other horse is registered and has his passport issued by Sport Horse GB but we know absolutely nothing about his parentage at all. He has competed up to Intermediate level BE eventing, the others are younger and are variously competing at BE100 up to Novice level. We would like to continue competing so is the secondary registration mentioned, either "Club or Sport" register the equivalent of our affiliated disciplines i.e. British Dressage, British Showjumping and BE (British Eventing)? Another question we would like to ask is about teaching riding in France. My son-in-law teaches very successfully in this country and was short-listed for the Olympic Games so a very experienced competition rider but has no paper qualifications. Would this preclude him teaching in France? I know these questions are very specific but maybe you could advise us whom we need to speak to as it may well affect our decision. "I run a livery yard and riding school in the Deux-Sevres, we have lived here for eight years. To compete at any level above club level (riding school) the horse needs to have full papers (i.e. breeding history) and needs to be registered with the Haras Nationaux. It would be sport not club you are wanting. Competitions are few and far between here, unless you want to show jump, so I would advise you to research your area very carefully to make sure you have ample events near enough to you. As for teaching in France, it is highly unlikely with no qualifications your son-in-law will be able to teach here, other than under the supervision of a French qualified instructor. The French are extremely hot on paper qualifications. I have BHS qualifications and twenty years experience and it has taken eight years to finally gain the right to teach in France. It is not impossible, just very, very difficult. Also, you will need to have an extremely strong command of the French language to even get off the starting post. Sorry it is not more straightforward, it is very different here and it is best you know what you are likely to be facing." Can you tell me if you still need to register your horse with the Haras Nationaux if you only do club jumping and if they need to be micro chipped for just club jumping? Thanks for contacting us. I was under the impression that you would not have to register your horse, unless you were doing more than club jumping, but I cannot say for certain. I would check with Haras Nationaux about this (http://www.haras-nationaux.fr/english-version.html), or search on Google for an equestrian establishment in France, as they should know. An update from the Allens which will be of interest to those wanting to compete in France, says that they have since discovered that you must register your horses twice in order to compete. Firstly with Haras Nationaux, and secondly with either a Club or Sport Register, depending on your level of competition. For the second registration, you must provide your horse's sire number which you can obtain from Haras Nationaux. Hi - things are finally coming to an end. We sent the passports back to the Haras Nationaux so they could give us the sire numbers. This was in June. We heard nothing from them for some time except to say that Candles For Pelly would have to have her name registered to be a brood mare. She wasn't going to be a brood mare, and after finally getting this point over, they said her name wasn't registered at all so we'd need to do that. Meanwhile they had sent our passports on to France Galop. By the time August came we still had got no further, still no sire numbers and still no returned passports. France Galop and Haras Nationaux were chased a number of times. A slight concern was that we were aware that horse owners must have their horse passports with them at all times. 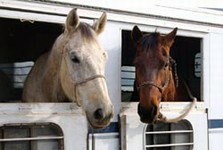 If the horse passports aren't available during a routine inspection, the horses can taken away. Last week the three passports came back with the sire numbers in them! We have sent a cheque for 101€ to have Candys name registered, so let's see how long that takes. Just a quick pointer - I have started to compete in France in Endurance at club level. All was going nicely until I was told last week, that as I am English, I am competing illegally in France despite having a French club licence. A quick phone call to the FFE later and my worst fears were conformed. Despite the fact I have lived here for over ten years, I have to buy two licences every year in order to compete - even at club level. It's the same for pro and amateur levels too. If you are English you must be a member of your sports organisation in the UK (in my case Endurance GB - cost of licence £55 + £22 fee as I am resident in France). Then you have to get a written authorisation from said association to state you are able to compete in France, then on top of that you also need to pay for a French licence (36 Euros every year), and then you can compete. But unless you change your nationality to French you can not ever participate in a championnat de France. Hope this info is useful to anyone wanting to compete at any level out here. This information is correct as of December 2013.